I don't cook. I don't bake. I don't make candy. But once a year I amaze my friends and confound my enemies by making chocolate covered figs. It is quite time consuming, and the recipe is very ... salacious. It's all about rolling the figs between your fingers until they are moist and supple, inserting a skewer into their little bottoms and filling them up...well, you get the idea. I drove my brother out of the room once just by reading him the recipe! 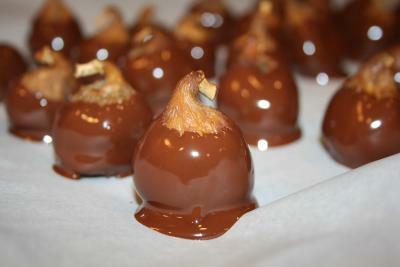 This year for the first time, I managed to get the chocolate covering properly tempered on a few of the figs. The rest of them were streaky and delicious. I figure that I'll get them all tempered in five or ten years! Heat cream in a saucepan over medium heat until it just starts to boil. Remove from heat. Stir in the chopped chocolate until completely melted and smooth. Cover and allow to set for several hours until firm. (This is your ganache filling - some people do like to chill it to hurry along the process). Soften the figs for filling by rolling them between your fingers. Poke a whole in the bottom with a skewer big enough to allow you to fill them. Stir ganache lightly and fill a pastry bag. Using a small round (1/4") tip, pipe the filling into the bottom of the figs. Allow to set again. Melt your preferred chocolate over a double boiler, (tempered is best), and dip the filled figs by holding them by the stem. Return them to the tray for their final "sitting." Store in the refrigerator and bring to room temperature before serving. I would suspect that they would be similar to chocolate covered strawberries when it comes to the matter of freshness and storage. In that case, you would want to store the chocolate figs in the refrigerator and serve them within a few days. Maybe Dinah can add her voice of experience and give us all a more definitive answer on the best way to store chocolate figs and how long they last. I hope yours turn out wonderfully. Do come back and report on your efforts. I have a friend with a very prolific fig tree. She plans to share them with me and I want to make fresh chocolate covered figs. How should they be stored to maintain their freshness and for how long? Years ago while in Spain I had some chocolate covered fresh figs which were also infused with chocolate-to die for! I'm glad you shared! I hope you'll add other chocolate photos and concoctions as you create them.